Chevrolet has been known for decades as a world leader in pickup trucks. From the mid-sized to the massive, the half-ton to the heavyweight, Chevy has been king of the pickup truck world. But, did you know that there is a whole slew of Chevy cars that do not get the recognition they deserve? They have been overshadowed by the big brothers in the Chevy family, namely the Silverado and the Suburban SUV. Of course, everyone knows about the Camaro and the Corvette. Their stories are legend in the automotive world, and they continue to build on that every year. The Chevy Bolt and Chevy Volt, the lineup’s electric and hybrid cars, respectively, are putting a charge into the eco-friendly auto world. But, there are still a couple of cars in the Chevy family that are geared toward the family-friendly consumer. In a market where family sedans are losing ground to the crossovers and SUVs of the world, the Chevy Malibu is still going strong. Chevy has also had other sedans in the past such as the Impala. Chevy is soon to discontinue the Impala which holds the record for most units sold in a single calendar year of any vehicle ever made. Some other Chevy sedans have been discontinued over the many decades of Chevrolet’s existence. That is a fascinating history lesson, but one for another time. For now, we will look at the Malibu, the Bolt, and the Sonic and see just what these fine Chevy cars bring to the table. The Chevy Malibu can trace its roots back to the Chevrolet Chevelle in the 1960s. The Malibu began as a trim of the Chevelle before getting its own nameplate in the early 1970s. It would be discontinued in the early 1980s, but revived in 1997. In 2016, the Malibu entered its 9th generation. 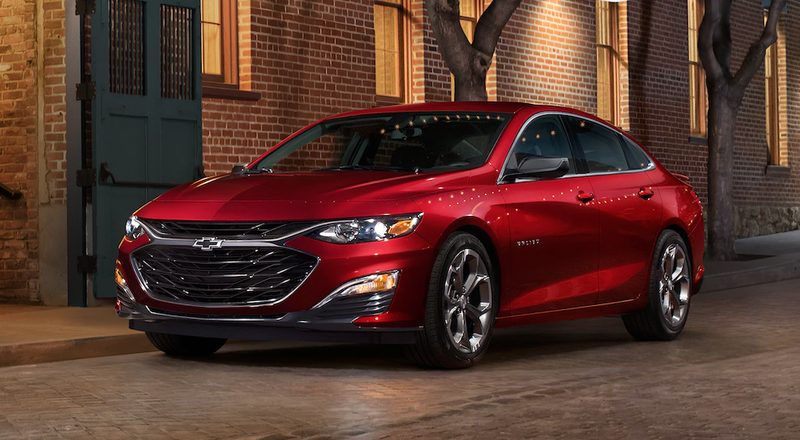 The 2019 year model got a facelift from the two previous years of the 9th generation; a new front grille was added, which gave the Malibu a broader front appearance. A brand new trim level, the RS, was added for a sportier appearance. This trim level adds custom 18” wheels and dual exhaust. As for the interior, it was refined in the way of a new touchscreen infotainment system and heated second-row seats for the Premier trim level. A new CVT transmission was also added, which helps improve fuel economy. Of course, since the Malibu has been around for so long and has been so popular for more than twenty years (at least in this iteration, anyway), you are quite likely to find used Chevy Malibus at your local dealership or even online. The 5th through 9th generations featured quality automobiles with plenty of powerful yet fuel-efficient engines, this includes a 7th generation hybrid that got 34 miles to the gallon, many of which are still on the streets today. In today’s ever-increasing eco-friendly consumer market, people all over the world are looking for a way to get around in their day to day lives without leaving a huge carbon footprint. Hybrids have been on the rise every year since the late 1990s, and all-electric vehicles are the next in line to enjoy that popularity. The Chevy Bolt is that all-electric car, debuting in the 2017 model year, and is the next wave of electric vehicles in the United States. The current year model features a lithium-ion battery that provides up to 238 miles before needing a charge. This equals about a 25 miles range per hour of charge. The engine offers 200 horsepower and 266 lb-ft of torque. One way to look at this engine, that most people can identify with, is that it has a fuel efficiency equivalent of 118 miles to the gallon. That alone is worth looking into, especially given the nature of fuel prices. Even though the Chevy Bolt is considered a subcompact hatchback, it still has an astounding 56 cubic feet of total cargo space. So, if you have a reasonable daily commute that requires taking certain work materials along for the ride, or if you are looking for a vehicle that can handle a weekend getaway for you and a friend, the Chevy Bolt is definitely worth the look. Known for a long time as the Chevy Aveo, the Chevy Sonic is a subcompact car that dates back to 2002. As the Sonic, it has been around since 2011. It can be had as either a sedan or hatchback, and comes in three trim levels – the LS, the LT and the Premier. Each trim level has a 1.4-liter turbocharged four-cylinder with 138 horsepower and 148 lb-ft of torque. When given the proper configuration and transmission, it can get up to 38 miles per gallon on the highway. While not the most powerful engine in the Chevrolet family, this little inline 4-cylinder is perfect for this small car and allows plenty of pep for the step. Perhaps best of all, this is one of the least expensive Chevy cars and even one of the least expensive in the entirety of the Chevy lineup. The base LS trim level starts out at only $15,420 MSRP and moves up only incrementally from there. You can get a fully decked out 2019 Chevy Sonic for well under $25,000 so depending on your lifestyle and driving habits, this might just be the perfect car for you. As we said earlier, the Camaro and Corvette have legends of their own and deserve proper time spent to them that we cannot afford to give here. Additionally, the Chevy Impala and the Chevy Volt are not much longer meant for this world. They are going into the recycle bin as part of Chevy’s corporate restructuring in the next couple of years. The good news is that there will be plenty of used Impalas and Volts on the roads in the years to come. Chevy also has a history of resurrecting nameplates (like they did with the Malibu), so who knows… we just might get to see these models again in the future. Chevy has a multitude of other car models in other parts of the world that are not sold in the North American market. Some of these include the Spark, Onix, and Prisma. Many of them are manufactured and marketed in cooperation with other major world automakers since the rest of the world’s automobile market is not as cut and dried as the North American market, in terms of territory. However, we are in the North American market and we know the Chevy vehicles that we see on our roads as trustworthy, innovative, and affordable. If you are interested in any of these Chevy cars, or any other Chevrolet vehicles, come on down to Carl Black Chevy Buick GMC in Kennesaw. Atlanta area drivers deserve to see the best that American engineering has to offer, and we definitely have that on our lot. Our sales staff can answer any questions you may have about any and all of the vehicles on our lot. From interior space of the Sonic to the MSRP of the Bolt, to the power under the hood of a Malibu, our talented sales team will be able to give you all the info you need, and then some. Until you can make it down in person, feel free to visit our website and see the photos and specs of all of our new and used vehicles. We will see you soon!